KCCS is providing CEI services for this project, which is divided into three different sections. Section 1, SR 758 (South Osprey Avenue) between Siesta Drive and SR 45, is a two-lane urban roadway with two 11-foot travel lanes and an 11-foot center bi-directional turn lane. Section 2, SR 758 (Bee Ridge Road) between SR 45 and Bond Place, is a seven-lane section bound by curb and gutter and 7-foot sidewalks adjacent to the curb. Section 3 consists of work covered by a Joint Participation Agreement (JPA) with the City of Sarasota to replace water lines. SR 758 will be milled/resurfaced and include new thermoplastic striping the entire length from Siesta Drive to Dunn Drive (3.8 miles). 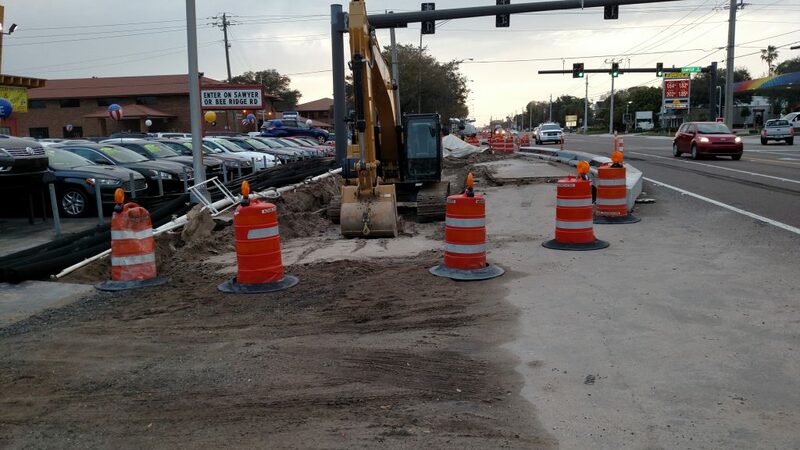 The project includes the removal and replacement of the existing storm drainage consisting of deep pipe varying from 24 to 66-inch pipe, along with associated inlets, manholes and conflict boxes , intelligent transportation systems (ITS) and Advanced Traffic Management System (ATMS), traffic signals rework, sidewalks, and median pedestrian island. All existing utilities, phone, cable water lines, and gas lines must be maintained in place during all replacement efforts.